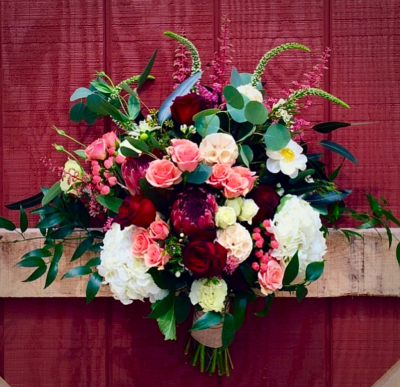 Nationally Certified Floral Designer & Arkansas Master Florist for Mountain Home, AR and surrounding areas. If​​​​​​​ you have bought​ flowers, you know they arent cheap. As a florist I know this as well. I look at it from a customers perspective, I want to spend my hard earned money on a product that I know is well crafted. I like knowing that the artist is personally sourcing the materials and putting time into my creation. I want it to have thought and passion behind it. If you decide we are a good fit and you think I am the person to create your vision, thats's exactly what you will get...passion. Nothing goes out my door that I wouldnt personally want brought to me. I take great pride in my work. So in short, I dont do wire networks or premade arrangements. This is why you wont see the typical run of the mill floral arrangements to click on and buy on my site. If you do want an arrangement feel free to call me and I will make create a piece for you. I do phone orders and take credit cards via phone. Feel free to look at my custom arrangements I have created in the Gallery section of this site.